We’d love your help. Let us know what’s wrong with this preview of The Eighth Day Brotherhood by Alice M. Phillips. To ask other readers questions about The Eighth Day Brotherhood, please sign up. The Eighth Day Brotherhood is a beautifully written, dark tale, rich with atmospheric details of Paris in 1888, a time period I've always enjoyed reading about. This suspense-filled story may not be for the faint of heart, as the grisly murders are described in vivid detail, befitting for this type of novel. It's obvious the author did her With a cover like this, how could you not want to read it? The gargoyle along would have me ripping the book off the shelves just to see what it was about. The Eighth Day Brotherhood is a beautifully written, dark tale, rich with atmospheric details of Paris in 1888, a time period I've always enjoyed reading about. This suspense-filled story may not be for the faint of heart, as the grisly murders are described in vivid detail, befitting for this type of novel. It's obvious the author did her research in regards to the mythological references and Paris itself, as the descriptions made me feel as if I were walking the streets with the characters. This is a captivating historical thriller filled with references to history, art, and religion that pulled me in from the first page. I'd love to see more of these characters. I do enjoy a bit of historical crime fiction, especially when there is just a hint, the tiniest suggestion, of something supernatural about the proceedings. The Eighth Day Brotherhood promises exactly that. The debut novel from Alice M. Phillips features a series of despicable murders, an enigmatic cult and a frantic race against time. What more could a fan of the spine-tingling ask for? The vast majority of the novel takes place, over the course of a single bloody week where the Eighth Day Broth I do enjoy a bit of historical crime fiction, especially when there is just a hint, the tiniest suggestion, of something supernatural about the proceedings. The Eighth Day Brotherhood promises exactly that. The debut novel from Alice M. Phillips features a series of despicable murders, an enigmatic cult and a frantic race against time. What more could a fan of the spine-tingling ask for? The vast majority of the novel takes place, over the course of a single bloody week where the Eighth Day Brotherhood reveal a series of artistic masterpieces that use kidnapped models as a centrepiece. The art that is the inspiration for these homages are all based on mythological scenes, and tend to require a human element that has been transfigured in some morbid fashion. Bodies are horribly mutilated and disfigured all in the name of art. As each day passes, there is a growing sense of unease among the populace of the city. What horrific tableau will the Brotherhood create next? Who else will suffer for their gruesome art? Prompted by very personal reasons to uncover the truth, local bookseller, Remy Sauvage, is resolved to capture the culprits. His unique specialist knowledge initially casts the shadow of suspicion in his direction, but the authorities soon realise that Sauvage is a valuable resource in their investigations. There is a grim determination to Sauvage’s character. He cannot fail, whatever the cost to himself. The author peppers the story with little details about Sauvage. He dresses in an anachronistic fashion. He carries a sword cane. You get the impression he likes everything just so. He has the kind of mind that lends itself well to investigation. He manages to be both methodical but also intuitive when he needs to be. Elsewhere a young artist named Claude finds himself also drawn into the Brotherhood’s dark conspiracy. A chance meeting with a potential muse puts him in direct conflict with the dark scheme that is unfolding. The author’s attention to her characters makes it extremely easy to visualise them all. In particular Sauvage and Claude come across as well rounded, almost vividly alive. There is a raw emotional quality to both men that feels almost palpable. In each case there is little doubt about the motivations that drive them to solve these brutal crimes. There are some other interesting themes scattered throughout the narrative. The artistic community, still mourning the death of literary titan Victor Hugo, are horrified at the march of progress. They view engineering innovations like the Eiffel Tower with a vocal distrust. There is a developing culture clash as the city races towards the new century. Everywhere there is evidence of the battle between the traditional versus the new. Paris is a city in a constant state of flux. It seems the ideal backdrop for a mysterious cult to unleash their unspeakable plan. I love how evocative the descriptions of the city and its denizens are. As I’ve mentioned before in previous reviews, I like to find a suitable musical companion to go along with reading a novel. My recommendation to accompany The Eighth Day Brotherhood is ‘Borne in Blood’ by Alex Roe. This soundtrack album does a grand job of matching the overall mood of the narrative with a gothic feel and sinister undertone. The title also seems entirely apt as well. This review has been hidden because it contains spoilers. To view it, click here. I received a free copy of this book. As usual these days, it's been a few days since I actually finished reading the book. "The Eighth Day Brotherhood" is essentially about several characters and their connections to a series of murders by a cult. If you're weak to any sort of gore, you may not want to continue. The first murder is of a male model, who is brutally disfigured and then propped up in a public area with his eyes burnt out and wings attached to his body, in order to rep I received a free copy of this book. The first murder is of a male model, who is brutally disfigured and then propped up in a public area with his eyes burnt out and wings attached to his body, in order to replicate Icarus. His lover, Remy, is distraught and determined to find the killer, but the 1800's isn't a place that's very accepting or understanding place for gay lovers or occult bookstore owners. The police are suspicious of him, but while that's happening more bodies show up the next morning. Remy sneaks off to do his own investigation. Meanwhile, we also follow Claude, a drunken, daydreaming artist who is captivated by one of the mental patients at an insane asylum. His father, a famous painter, passed away and he's since been raised and trained by a friend of his father, Baltard. Baltard is another well-known painter, but his style of painting is out of fashion now. Still, they're wealthy and famous, and he's doing his best to train Claude to be a good painter. I'm not sure how much I'll have to say about this book because I didn't take many notes. I didn't have to make notes about mistakes or anything. As far as the downside, I think I can say mostly two things. One: The book switches between points of view fairly often. The sections are separated, but it's not a new chapter each time. I understood this after a bit, but because of how it started like this I became confused initially, and some of that confusion carried over throughout the book. We see the point of view of the culprit first. When we switch to Claude's view, I thought he was the messenger because I thought it was going back and forth. I kept thinking that for quite a while. Two: Sometimes the language is a bit flowery for me. I'm more of a short, concise person, honestly. I wouldn't say it's overbearing, though. Other than that, I really didn't have any issues. Well, I suppose maybe I had an issue with the bad guy. It can be very hard to write smug, insane bad guys without making it seem like they're evil for the sake of being evil for the plot. He had some backstory to him, but I never felt like it was overly convincing why he and the others all partook in the murders. It was basically like a bunch of people taking a Ouija board way too seriously. I enjoyed the plot and following different characters. The book definitely covers the unfair treatment of woman, with two lead female characters who have lost everything for one reason or another, and are basically kept like prizes for men. The insane asylum is essentially a prison for women who didn't have anyone who would stand up for them, and they're used and abused on a whim. Even the model who works in the wealthy home of Baltard is there because 'he had to have her'. I don't believe we ever even learn her real name, because he couldn't pronounce it and just called her the name of the town she's from. I think, in one way, the ending was my favorite part, and I'll spoil that here. After the The Eighth Day Brotherhood slaughters, mutilates, and displays the corpses of many models in their futile quest for immortality and finding another world, they're readily forgotten quickly as soon as their caught. Considering their quest to make themselves so important and eternal, I think it was the most suitable punishment for them to bear - being gone and forgotten like a few grains of sand on the beach, easily replaced by the next scandal that comes up. I wish this was the sort of message that more criminals got. A beautifully dark tale by an expert on the historical setting -- in my entirely unbiased opinion as the author's husband. But I honestly found it incredibly gripping. I agree with Alasdair's blurb on the cover: somewhere Poe is nodding approvingly. It's Paris, 1888, and someone is committing heinous murders by turning artist models into sculptures of mythological figures. The police are baffled, but occult bookstore owner Rémy Sauvage thinks he sees a pattern. Driven by revenge for one of the victims, Remy eventually joins forces with Claude Fournel, a second generation artist, and his mental hospital patient turned muse, Margaret Finnegan. The trio tries to stop the murders and clear the suspicion that has fallen on them directly. As Paris prepares to reinvent itself in the world’s mind, they can scarcely bear a black eye such as this. Imagine if Dan Brown had ever actually read a book all the way through, looked at a piece of art that wasn't four panels long and pinned to a cubicle, or experienced a feeling of joy that wasn't related to something from a Sharper Image catalog. This is a very dark tale of symbolic ritual murder committed by a handful of psychotic painters in Paris in the late 1880s. The story is intense and heart-rending weaving a spiders web of intrigue encompassing a number of romantic artists of the Parisian community of romantic artists and a depraved, but well–known (in the story), psychiatric hospital, l’Hopital Sainte-Genevieve and its infamous director, Dr. Jacque-Andre Veyssiere. The characters of the Eighth Day Brotherhood are well developed a This is a very dark tale of symbolic ritual murder committed by a handful of psychotic painters in Paris in the late 1880s. The story is intense and heart-rending weaving a spiders web of intrigue encompassing a number of romantic artists of the Parisian community of romantic artists and a depraved, but well–known (in the story), psychiatric hospital, l’Hopital Sainte-Genevieve and its infamous director, Dr. Jacque-Andre Veyssiere. The characters of the Eighth Day Brotherhood are well developed and believable. The grief they exhibit after each murder seems appropriate and creditable. The character’s actions are reasonable given the context. The bad guys are bloody, unconcerned with their actions as they influence the present, and universally focused on a delusional future. Truthfully, books like The Eighth Day Brotherhood are not my favorite. However, I found it to be darkly entertaining and captivating and even though it is predicable it remained interesting to me to see how the story carried through to the end. This is a book for those who like macabre dark mysteries and psycho-thrillers. If you want a novel with the milieu of The Stress of Her Regard but tighter pacing, look no further. Couple this with the sensibility of Fincher’s Se7en and you have a tense and relentless thriller. I struggled a bit at the beginning to wrap my arms around the cast of characters, but once that clicked into place for me, I was locked in for the ride. Alice’s love for the tenebrous portions of the Decadent period glows through Paris while the Eiffel Tower rises on the bank of the Seine and as the c If you want a novel with the milieu of The Stress of Her Regard but tighter pacing, look no further. Couple this with the sensibility of Fincher’s Se7en and you have a tense and relentless thriller. I struggled a bit at the beginning to wrap my arms around the cast of characters, but once that clicked into place for me, I was locked in for the ride. Alice’s love for the tenebrous portions of the Decadent period glows through Paris while the Eiffel Tower rises on the bank of the Seine and as the city prepares of the Exposition Universelle. It manifests with an abiding love for the period supported by an incredible depth of research. Do yourself a favor and pick up this book. Yep, passing all day and part of the afternoon reading this beauty that reminded me a lot of "The Da Vinci Code" and "Sherlock Holmes" while eating chocolate. Months ago I've found it in the Reign of Reads bulletin as free book; when I've read the synopsis, it caught me inmediately. Sincerely, I've never expected that this book would keep me caught in my seat, thinking about what the hell would happen next. Even though there were times that its pace was pretty slow, the story was exciting, with w Yep, passing all day and part of the afternoon reading this beauty that reminded me a lot of "The Da Vinci Code" and "Sherlock Holmes" while eating chocolate. Months ago I've found it in the Reign of Reads bulletin as free book; when I've read the synopsis, it caught me inmediately. Sincerely, I've never expected that this book would keep me caught in my seat, thinking about what the hell would happen next. Even though there were times that its pace was pretty slow, the story was exciting, with well-written descriptions and well-built characters. Sublimely crafted amazing story, well developed characters and great historical setting. Must-read! Back in October I attended a reading hosted by Alice M. Phillips at ICON 41. I knew I had to purchase a copy of Alice’s book after the reading was done for two reasons. It was set in Paris during the construction of the Eiffel Tower. The book started on my birthday (August 1). 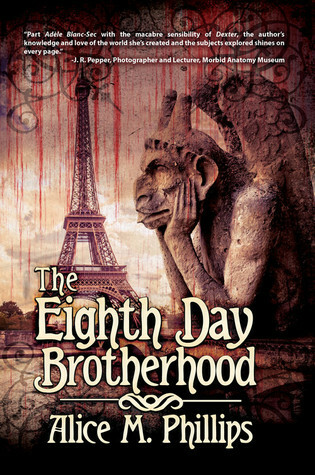 The Eighth Day Brotherhood is a quick, mysterious romp through 1888 Paris. Pulling in religious and mythological iconography, Phillips transports the reader to the streets of Paris filled with starving artists and crazed kill Back in October I attended a reading hosted by Alice M. Phillips at ICON 41. I knew I had to purchase a copy of Alice’s book after the reading was done for two reasons. The Eighth Day Brotherhood is a quick, mysterious romp through 1888 Paris. Pulling in religious and mythological iconography, Phillips transports the reader to the streets of Paris filled with starving artists and crazed killers. With each day being a chapter and the weaving of Biblical and mythology stories, The Eighth Day Brotherhood reminded me of Dan Brown’s novels in both its style and pacing. The characters and locales in Paris came alive in Phillips writing. Many times I felt as if I was walking the streets with Claude and Remy. I shivered when the mysterious Messenger made an appearance. And my heart ached for Finn as her journey was slowly told. While the end of the story and the grand reveal felt a bit rushed as I don’t feel there were enough plot clues to connect at least one person to the murders, overall, I was satisfied with the pace of the story, the majesty of Paris and the believability of the characters. Phillips painted a taut mystery with a satisfying conclusion.